Seat yourself comfortably on the lift to the top of Hafjell mountain, where you can glide right into all kinds of skiing possibilities, from ski school and gentle blue slopes to seriously challenging black runs.
. In addition to this, Hafjell is the first resort in the Nordic countries to offer SkiMovie, a separate slope equipped with automatic timing and filming equipment. How cool is that? In the spring, summer and autumn, Hafjell Bike Park with its numerous trails is a world class venue for downhill and trail biking. The difficulty ranges from beginner to expert, with a mix of excellent man-made and natural trails. If you’re more of a hiking type, you can take the Gondola to the top of the mountain and pick one of several hiking trails, some of which are even suitable for prams. The area is also great for hunting and fishing. Hafjell’s culinary flagship, Skavlen Restaurant, lies right next to the Gondola. Choose between delicious Italian pizzas, tender lamb shanks or irresistible cinnamon buns. Skavlen is just one of several exciting eateries in the resort. With only a 15 minute drive from Lillehammer it is easy to get to Hafjell and around. If you want to spend the night, the mountain has a wide range of accommodation alternatives, from cabins and chalets to modern ski in/ski out hotels. Find more inspiration on Hafjell’s official website. Check out Hafjell‘s live webcams from Mosetertoppen and Hafjelltoppen. Lekeland Hafjell - One of Norway's largest indoor playland located in region of Lillehammer. An excellent 9-hole park/forest course with large greens and a range of challenging hazards. A gentle ride through the stunning scenery of Gropmarka to the friendly Lillehammer town centre. Close to Hunderfossen Familypark, Lilleputthammer and Hafjell Bike Park. Aasletten Pensjonat og Hytter is located next to the base station at Hafjell Alpine Centre. DNT cabin number 575 is an independent part of the building stock at Hornsjø. Odden Camping is located 6 km from Hafjell and Hunderfossen. Pellekroa is situated at mount Hafjell by Pellestova Hotel, right next to the cross-country tracks. Pellestovas restaurant combines Norwegian traditional food with international trends and playful creativity. Go night skiing in floodlit slopes, join the kids in one of several areas for children, be an alpine star for a day with BMW Ski movie, or enjoy the silence in more than 300 kilometres of cross-country tracks. Go night skiing in floodlit slopes, join the kids in one of several areas for children, be an alpine star for a day with BMW Ski movie, or enjoy the silence in more than 190 miles of cross-country tracks. The Hafjell Round starts at Ilsetra, and then climbs gently up to Pellestova. Hafjell is located 15 minutes from the Olympic town of Lillehammer. 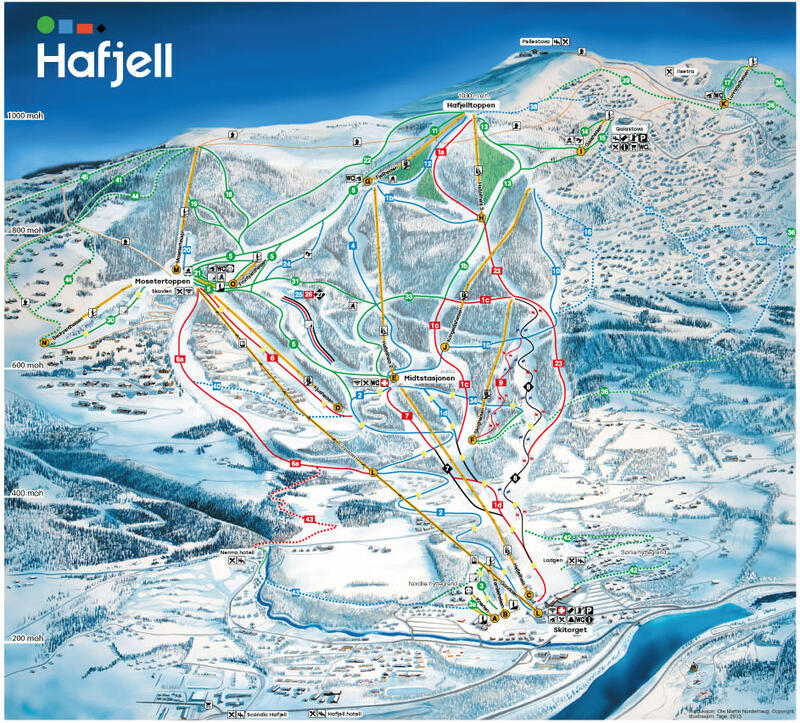 Get in-depth travel information at Hafjell’s official website. The regional train service have daily departures to Lillehammer from both Oslo and Trondheim. From Lillehammer you can take corresponding busses to Hafjell Ski Resort. You can reach Lillehammer by bus from many destinations in the country. From Lillehammer, there are many bus departures to Hafjell during the winter season, with regular buses, ski buses and restaurant buses. Hafjell is situated about 15 kilometres north of Lillehammer, and around 200 kilometres north of Oslo. If you choose to go by car from Oslo, follow the E6 or Rv4 via Gjøvik. The journey takes around 2,5 hours. Oslo Airport is Norway&apos;s main airport and serves over 100 domestic and international destinations. From Oslo Airport you can reach Oslo&apos;s city centre by express train, express bus, local train, hire car or taxi. Many European cities have direct connections to Torp Sandefjord Airport, which can be reached from Oslo by express bus or train. The trip to Oslo from the airport takes around 2 hours. Hafjell is situated about 9 miles north of Lillehammer, and around 125 miles north of Oslo. If you choose to go by car from Oslo, follow the E6 or Rv4 via Gjøvik. The journey takes around 2,5 hours.